The SPA122 is a widely used and extremely reliable two-line VOIP telephone adapter. Until now you might have been using an SAP122 to provide one or two analog telephone lines from VOIP.MS service. Such a connection would have used UDP (not TCP and not TLS) for the SIP signaling, and thus would have been at risk of eavesdropping. Likewise such a connection would not have used SRTP for the voice traffic, and thus would have been at risk of eavesdropping for that traffic as well. 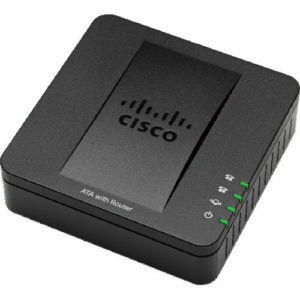 You already know how to log into the administrative interface of your Cisco SPA122 ATA. Each telephone line in the ATA that is connected to a VOIP.MS trunk shows a status of “registered” in the ATA. Each SIP trunk shows a status of registered in the registration status screens of VOIP.MS. With all of these assumptions in place, it will be appreciated that all that you really need to accomplish is turning on TLS for the SIP connection, and turning on SRTP. It is easy enough, in the administrative interface of the Cisco ATA, to figure out how to change the SIP signaling from UDP to TLS. Having figured this out, you might think that it would be an easy matter to click around in the administrative interface of the Cisco ATA to figure out how to turn on SRTP. If so, you would be wrong. The four-letter string “SRTP” appears nowhere in any of the configuration screens of the Cisco ATA. This article explains how to do this with the Cisco SPA122. Go to voice/line1/proxy-and-registration and look at “proxy”. If it contains a numerical digit, no action required. If it does not, change it to a POP that contains a numerical digit (see the VOIP.MS wiki article). If you make a change, you may need to make a corresponding change at VOIP.MS in the relevant DID function such as a DID or ring group. Go to voice/line1/Supplementary-Service-Subscription. Check that “secure call serv” is set to “yes” (this is the default). Click “submit”. You will have to wait a minute or two for the ATA to reboot. Click “submit”. This will not require a reboot so it will not take as long. You may only have to wait thirty seconds or so for the ATA to return to an administrative screen. Now check the registration status at VOIP.MS which should be green with a padlock icon indicating a secure connection. And check the registration status in the ATA which should say “registered”.